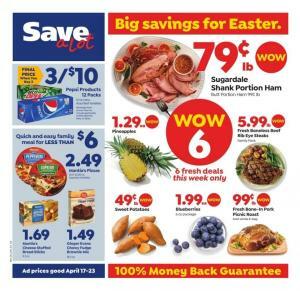 Browse the Save A Lot Ad Ad that offers weekly savings on many grocery products, deli foods, bakery goods, and many more categories. A classic grocery store that has many locations in the United States. Shop nice fresh fruits at lower prices that are usually promotions on the weekly ads. The retailer has also recipes for nice meals. They also have a smart shopper club that will get you the latest deals. Sometimes you may find $1/ea products in the ads. If you like limitless deals like special buys, you can browse the Save A Lot Weekly Ad to grab some of those. Save A Lot has 1280 stores in 36 states. The store has original products of its own brand, too. They can be much cheaper than regular products. Bakery, dairy, frozen food, snacks, seafood, liquor, deli, and more categories can be in the weekly ads. Subscribe to the newsletter to get the latest posts and ads in your inbox. 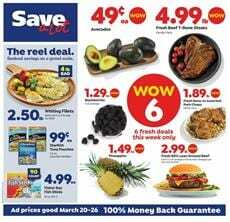 See the new deals on blackberries, t-bone steaks, pineapples, 80% lean ground beef, and more with Save A Lot Ad Mar 20 - 26. One of the conveniences that I like about supermarkets like Save a Lot that I can find many products like Pickwell Farms canned-food variety. They have tomatoes, sliced carrots, sliced potatoes, sauerkraut, tomato paste, and more products. Ingredients for your meals, quick side dishes, or whatever purpose you use them. Find the best prices of Pickwell Farms products on pg 3. Also, shop special buys deals like Coke. 12 packs will cost $11 for 3. Coffee-mate non-dairy creamers will be only $3.59! Save A Lot has also offers of drinks on the same page. To track the deals from the future Save A Lot Ads or other weekly ads follow our Facebook page where we share the deals. Subscribe to get newsletter in your inbox. Don't miss out other weekly ads.